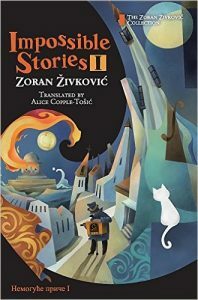 Impossible Stories I is one of Cadmus Press’s first offerings in its Zoran Živković collection, and this volume is beautiful both inside and out. Through the cover art by Youchan Ito, and the translation from the Serbian by Alice Copple-Tošić, we are able to step into these five bizarre yet fascinating novellas, expecting the unexpected. I had never read Živković before, and so my delight with his metaliterary games and unease with his characters’ situations allowed me to truly experience his work with an open mind. The five novellas included in this collection are: Time Gifts, Impossible Encounters, Seven Touches of Music, The Library, and Steps Through the Mist. Unlike most great works of fiction, which have fully-developed characters and richly-descriptive scenes/worlds, the stories here are overtly about storytelling itself. Over and over again, Živković builds up a series of situations only to double-back and make the reader reconsider how all of the pieces fit into the puzzle. If my description here sounds awkward and unclear, that’s because it’s difficult to explain a Živković story. I’ll give some examples instead. Whether or not Živković actually works this way, each of his novellas seems to spring from a single philosophical question. In Time Gifts, it’s “what would happen if we could be sent back into our past?”; in Seven Touches of Music, it’s “how can music shape and re-shape our concept of reality?” Each novella is then split into several chapters, which in turn attack the overall question from its own unique angle. In a way, Živković’s tales are obsessed with structure, process, and analysis, as if each is its own mathematical problem. It follows, then, that the characters aren’t very developed because that’s not the point- Živković uses them to explore questions and theories, as well as his own role as author/creator/god. Of these five novellas, I enjoyed Impossible Encounters most, with its exploration of reincarnation, fictional characters visiting their authors, and God Himself hanging out on a train to chat with a passenger. In each of these chapters, Živković raises fascinating questions about the human mind’s perception of reality. “The Window” suggests that humans have one chance to decide on their reincarnation- does someone want to come back as a bird, a flower, a human? After that, there is no more choice. In “The Cone,” a man climbs a favorite mountain trail only to encounter an older man there who reminds him of himself…and actually is himself. From the future. The other stories feature God, the devil, and a fictional character who is actually an alien. Tying all of these stories together, though, is the last one, which features the writer of Impossible Encounters getting a visit from a character straight out of Impossible Encounters. That’s right. At one point, the nameless character asks the nameless writer, “what is real? Didn’t you write Impossible Encounters in order to show that there is no distinct boundary separating the real from the unreal?” This kind of moment occurs throughout the collection, making me inevitably think about that Star Trek TNG episode in which holo-character James Moriarty is led to believe, erroneously, that he has stepped out of the fictional holodeck world and into “reality.” Here, Živković has written a novella that includes a story about a writer who has written a novella of the same name and speaks to one of his characters about including himself in the novella in order to gain a kind of immortality (excuse me while I take something for this headache).